Trying to get your kids to eat a bowl full of greens might not be a reality for you. But getting them to eat a popsicle, probably is! We believe that offering your kids fruits and vegetables in a variety of ways, using a variety of preparation methods is the most effective way to get them to eat lots of different fruits and vegetables. 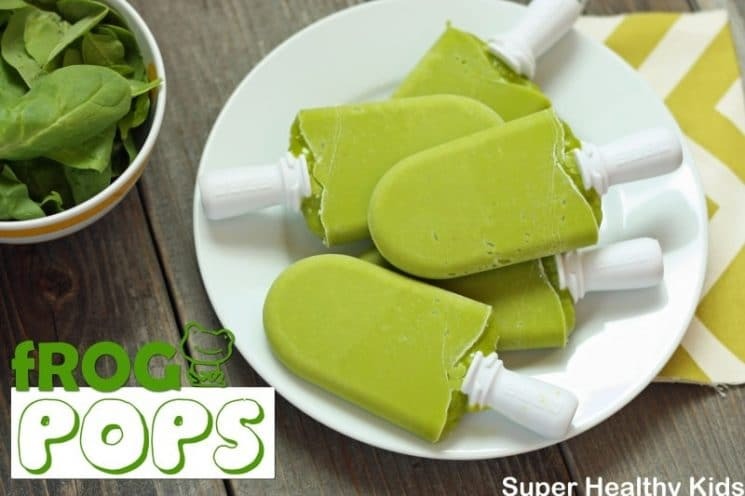 This Green Frog Pops Recipe is a great way to offer kids not only spinach, but other fruits along with it in a really fun way! 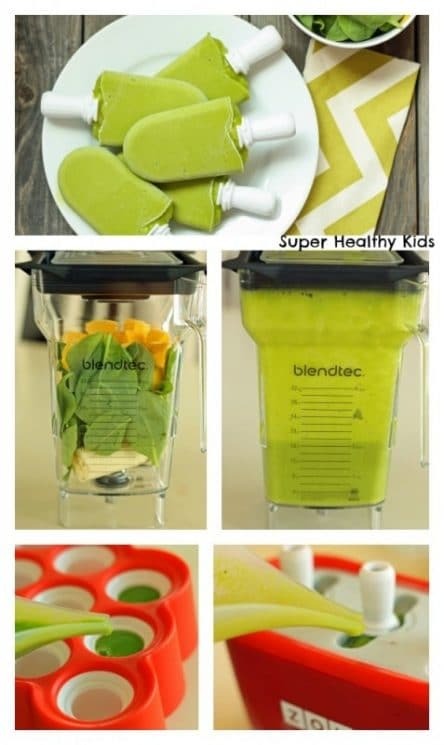 To make these you will need 4 ingredients, a blender, and popsicle molds. 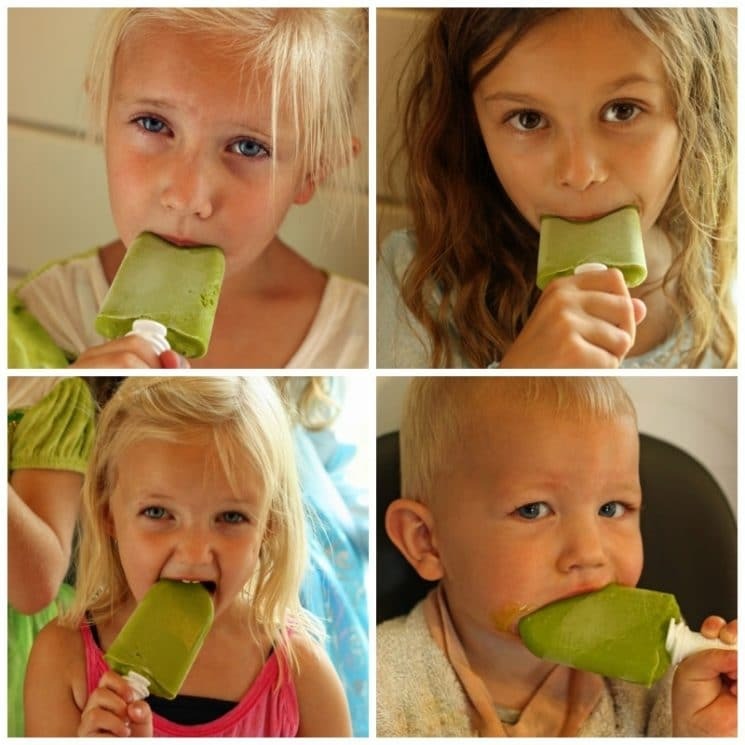 We love our Zoku pop molds because you can make popsicles in 7 minutes, start to finish! We also love the mini pop molds because they are the perfect size for a toddler. Any popsicle mold will work great though. 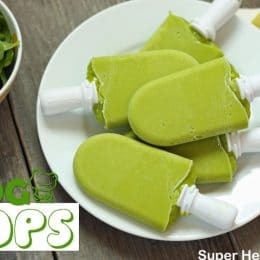 Our ingredients for this popsicle are spinach, banana, frozen mango, and coconut water. The combination makes these super sweet, packed with nutrition, and bright green! Blend together until smooth, and then pour into your molds. Freeze and enjoy! Sometimes you don’t know if your kids will like the things you make. My kids (including our neighbor friend) loved these! When my kids have friends over playing, they become my test subjects 🙂 They asked what was in them and I told them, and they weren’t even phased. I told them I was making Frog Pops and they were super excited to try them just because of the name. Blender together until smooth. Pour into popsicle molds and freeze. Enjoy! Substitution for mangos please!!! Highly allergic! I’ve substituted different milks and yogurt in the Popsicles I’ve made so far. Almond milk went over well as did plain Greek yogurt. Those pops seemed to be a bit thicker and hold together well…. following, we are also allergic to coconut and would like an alternative??? I want to try it with vanilla almond milk in place of the coconut water..I’m sure it would still taste amazing! What a great idea! Mandy – we are allergic to mangoes (and coconut) so I’m going to make these using apple juice for the coconut water and peaches for the mango. Following.. would like ideas on this also! I don’t have mango on hand so I’m trying watermelon with it! This looks great! Does anyone have a good banana substitution? Banana allergy here. I am considering either leaving it out all together, or substituting with avocado. Help! Hate banana, what else can I use as assuming the banana adds the ‘creaminess’? You can definitely just use plain water. It still tastes delicious! Definitely just use plain water if you can’t have the coconut. Your toddler will love it! My baby is getting his first tooth and he loved it! You can use pineapple and it will work great! I tried with almond milk and threw in some frozen pineapple … And I did as a smoothie, tasted good go me and I’m NOT a veggie water but am trying to get my daughter to be a more balanced eater than me! Can you use frozen baby spinach? Allergic to bananas. Is there anything we can use as a replacement? Sounds good! Hi it’s me Karen! Nice to be in touch! I posted this same thing, but for some reason it isn’t showing up. I am also allergic to bananas. I am going to try avocado. They are closely related though, so if your banana allergy is severe, I would probably not do it. I just want to write and say THANK YOU SO MUCH! My 15 month old is badly teething and going through a fussy eating phase of not wanting any fruit or veg. I made these pops today and he couldn’t get enough of them! I used pineapple juice mixed with water and am going to play around with different fruit and veg. YOU ARE MY NEW FAVOURITE PERSON! Hi, i have one question about the spinach. Many ppl say we should cook spinach to remove oxalic acid. But i see many of your recipes using raw spinach. Can toddlers eat raw spinach? I love these substitutions! Super easy and they sound delicious, too. Thanks! Yep. I use it all the time. Heather and Emily – The banana acts as a sweetener and also a creamy component. You can try adding a different frozen fruit, or silken tofu with a sweetener like dates. Ha!! Glad we could help – these really are the best 🙂 My teething toddler loves them too right now. Can I substitute avocado for spinach ?? I don’t mix my fruits & vegetables ?? I made this today! They didn’t have frozen mangoes so I used frozen peaches instead. I also used 2 bananas instead of one. I added a touch more coconut water because I didn’t want to overwork my blender. The pops came out fantastic and it’s amazing as a smoothie as well.